He’s my favorite kind of horse – a plain bay thoroughbred gelding. However, once he gets moving, Sea Lord is anything but plain, or average. You see, he’s a confirmed Grand Prix horse, and has been winning (with very good scores) under Sliva Martin. I’m constantly surprised that TBs don’t find more favor with ammy riders. Those that have raced are the ultimate BTDT horses – vetting, trailering, bathing, shoeing are not a problem, nor are golf carts, goats, dogs, loud speakers and crowds. They do need to be re-trained when they leave the track – OTTBs strongly associate being ridden with running, for example, and things like standing for mounting are foreign concepts. But TBs are fast learners and are eager to please. 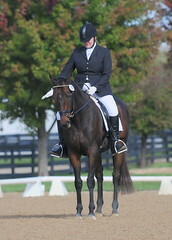 A few months with an adept trainer who understands OTTBs will produce a really nice horse. My trainer, Christy Rettger, recently detailed the progress of her current young project, and he really has transformed in the short year she’s had him. Generally speaking, thoroughbreds are real athletes, and have great work ethics and forward gears that are conducive to higher level work. True, they are not purpose bred for dressage – you will have to do some work and ride the horse correctly to get it through and over its back. You can’t “fake” it with a TB like you can with a warmblood that has higher natural head/neck carriage. But they are budget-friendly, willing and beautiful partners – I love how elegant a TB looks in the ring, compared to a heavier horse. Anyway, this seemed like a good day to plug Thoroughbreds for dressage. Did I mention that Sea Lord is for sale? If you have the ability and the cash, you could be gracing a GP ring near you on this refined and elegant creature. And if you’re in the market for your next mount, consider a Thoroughbred. At least go ride a few. I bet you’ll be glad you did.